The Noto Peninsula (能登半島, Noto Hantō) juts out into the Sea of Japan from the northern half of Ishikawa Prefecture and is more secluded in comparison to the other parts of the country, retaining much its rustic old world charm. The peninsula is particularly known for its remarkable coastal scenery, parts of which are dotted with small fishing and farming towns. National parks adorn the rest of the landscape, giving the peninsula much of its raw beauty. For Maya, Nadiah and myself, this was our very first cycling trip together and the experience of it all definitely makes us want to plan for more! Looking back, I can no longer imagine myself traveling without a bike – it just adds such a wonderful dimension that you would otherwise miss if traveling in a bigger vehicle. Why choose Noto to start our touring adventure? What better way to begin than in a completely different country, culture and landscape! And to top it all off, neither Nadiah or I had any touring experience, so it was all very much brand new for the both of us. Maya had some touring experience, but in a fully supported group of road cyclists. Noto was our first self-supported tour, and I'm happy to say that we absolutely loved it. Enjoying the golden hour along the beautiful bike path while going through Hakui. Although the Noto peninsula is in a more secluded part of Japan, we never felt that we were in any real danger of getting lost or not being able to find food and shelter. In fact, cycling in Japan is the best place to start touring because help isn't too far away in case of an emergency. That and mobile phone connectivity is superb. The Noto Peninsula was the perfect place to begin our cycling adventure because of its beautiful natural landscape, moderately challenging terrain, and quaint seaside towns with wonderful hospitality. We recommend starting from Kanazawa and going clockwise from there. In total, our very first cycling tour wasn't a very long one at just seven days, but it proved to be one of the best traveling experiences we've had so far. We started our tour from the beautiful historic city of Kanazawa, cycling along the Noto Peninsula coastline until we reached Takaoka. On the sixth day from Takaoka, we took the train to the alpine town of Takayama. We chose to travel light for this trip with about 10kg of luggage for each of us and stayed at a mixture of hotels and small inns along the way. Our trip stretched from the last days of October into the first week of November in 2016. The daily average temperature around this time was around 10 degrees Celsius or 50 degrees Fahrenheit, with a fifty percent chance of showers. There also weren't many daylight hours with the sun setting at around 5pm (something to take note of when planning a similar trip). With that said, we packed our base layers and rain layers and were more or less prepared. The total traveling distance between Kanazawa and Takaoka was approximately 330km for the route that we planned. We booked our lodging ahead of time so we knew exactly where we would finish for each day of travel. There's certainly a lot to share and I will provide information about our overall experience across two parts. For this post, I'll start by providing the most important information first: Flying to Japan with a bike and getting to the starting point. The Birdy can be folded in its natural form without removing the wheels. This means that the most sensitive parts of the bike such as the rear derailleur and chain are already protected by virtue of the Birdy's fold itself. The only thing I had to remove was the rear rack and saddle which wasn't much of a problem. The padded bag that I used was the Dahon carry bag which I managed to find at USJ Cycles. Another great option in a similar size is the Tern Stow Bag. The version of the Dahon bag that I got had a big graphic of a bicycle on one side so it was quite obvious what was being transported. I also added an external luggage strap to keep things together just in case. The overall weight was around 17kg, which was safely under the 30kg weight limit. I could check this in with my airlines as sports equipment and they will treat it as oversized luggage. This means that it will be the last item that gets brought into the plane and usually handled manually. And since the overall package isn't that heavy, it means that it'll be easier for the airport baggage handlers to treat it well (which they did). The padded bag doubled as a cover for the bike so that it could be wheeled into trains in folded form, because at one glance it appears to be not much different than luggage. Fitting the Birdy bike into a padded bag from Folding Tales on Vimeo. There's a lot more detail regarding our experiences with air travel and bikes, and up to this point, we've done at least three trips that required flying with our bikes. We'll cover all of that in a separate blog post all about transportation and logistics. Kanazawa is a beautiful and historical city that serves as the capital of Ishikawa Prefecture. There's so much to explore here including many historical attractions such as restored residences and old tea house districts, as well as modern museums. For those who have been to Kyoto, Kanazawa feels very much like it without the tourist hordes, and is sometimes dubbed "Little Kyoto." 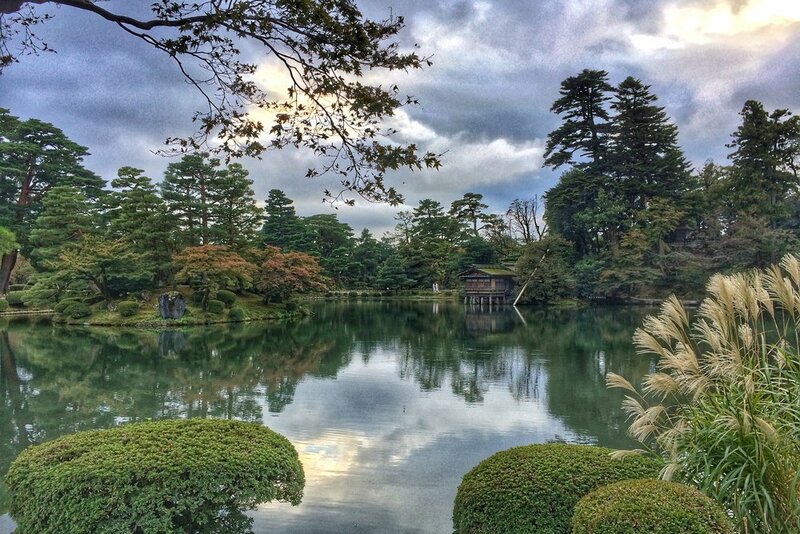 The sublimely beautiful gardens of Kenrokuen in Kanazawa, right before sunset. This quaint city has a unique gem that sets it apart from any other. No visit to Kanazawa is complete without basking in the sublimely beautiful gardens of Kenrokuen, one of Japan's "three best landscape gardens" and considered by many to be the most beautiful of them all. It was only appropriate to kickstart our journey in this city. Getting to Kanazawa is fairly straightforward from Tokyo. Upon landing at Narita International Airport, you have the choice of taking a connecting flight to Komatsu airport, or taking the Shinkansen directly from Tokyo station all the way to Kanazawa station. If you need a mobile data plan, you can get them from one of the many kiosks at the airport. If you are coming from Malaysia, I highly recommend purchasing a data plan ahead of time as it is cheaper. I went with Yokoso SIM and had no complaints throughout my travel period. When traveling on the Shinkansen or any train in Japan, please ensure that your bike is completely covered in a bag. If you need to have a wheel or two stick out for easier rolling mobility, make sure that it's hidden towards the bottom so it's not obvious. Get a seat that's closest to the front or rear of the carriage where there is space to stash a folding bike, be first in line at the platform, and always have at least two bungee cords to secure it in place. And of course, I must share with everyone the most useful website for using the train in Japan: Hyperdia. It is absolutely accurate and allows you to properly time your transits so you are not rushing. We swore by this. Before we started our cycling tour into the Noto Peninsula, we made a few decisions about how we wanted to travel while we were cycling. As we were using folding bikes and it was our first time touring in Japan, we wanted to keep things as simple as possible. Each of us kept our luggage under 10kg. This meant carrying enough essentials for three days, consisting mainly of clothing, some snacks, cameras, cables, chargers and other small things. I had a pair of the Ortlieb Sport-Roller Classic panniers which fit everything I needed just nicely. Nadiah and Maya chose to go with a small backpack and dry bags which worked really well when strapped to their rear racks with bungee cords. Prepped and serviced by the kind folks at Model T in Kanazawa. Ready for the long ride ahead! We also made a pit stop at Model T in Kanazawa, a quaint bike shop that had everything we needed including Panaracer spare tubes in the right size. Nadiah had to replace her front tube, no thanks to a puncture that was patched up but didn't quite hold up. The mechanics at the shop also helped to check our disc brakes and derailleurs (always a good idea after transport) to make sure that everything was in working order. With a few minor servicing tweaks, we were all set to go. My sashimi dish just about to be served. Fantastic Izakaya experience at Itaru Honten in Kanazawa. Before setting off though, we wanted to celebrate the start of our adventure with a hearty meal. After doing a bit of quick research and speaking to a few locals, we went searching for a neighborhoud Izakaya restaurant that actually wasn't too far away from the bike shop. Itaru Honten Izakaya was the place, and it did not disappoint! Maya ambitiously ordered the "Samurai set meal" which pretty much translated to A LOT OF FOOD, so we ended up having to help her finish. Great selection of dishes and a wonderful Izakaya experience not to be missed! And make sure to bring enough cash, because that's just how they roll. The luggage forwarding and delivery services in Japan are amazing and deserve special mention. The most famous of them is Yamato, fondly remembered by their logo of mommy cat carrying her kitten. Their service is called TA-Q-BIN and is very well known across all of Japan. When traveling, there is often very limited space in trains (or in panniers for that matter), so it is always best to forward your luggage to the next destination if possible if you happen to be carrying a lot of stuff. It's also a great way to make sure that you can continue to collect souvenirs along the way while traveling and not have to worry too much about having to carry everything. From Kanazawa station, we packed up everything we did not need into one big suitcase and went to the parcel delivery counter to forward it to our hotel in Wajima, our midpoint destination. When we arrived in Wajima a few days later, our suitcase was waiting for us and we took the opportunity to reconfigure our belongings and forwarded it to Takoaka, where we repeated the process one last time for Tokyo. Most hotels already have all the delivery forms handy at the front desk, and will gladly arrange the entire process for you. And one very important thing to note is that they charge per piece of luggage, so it's always best if you can just use a single suitcase for everything to make the delivery easier and cheaper.